In 2018, corporate palm oil buyers concerned about reputational and financial risks are looking for sellers whose product is covered by reliable No Deforestation, No Peat, No Exploitation (NDPE) policies. But the Government of Indonesia has proposed moving in the opposite direction, loosening requirements for a certification program known as the Indonesian Sustainable Palm Oil Standard (ISPO) aimed at making their product attractive to buyers. ISPO was first deployed in 2009 as a means for increasing the sustainability of Indonesian palm oil. While it was mandatory in comparison with RSPO, its requirements were much less stringent. In part because companies using ISPO continued facing allegations of human rights abuses and land grabs, it didn’t reach the same level of international recognition as the RSPO certification. In January 2018, the new draft regulation written by the Government of Indonesia on the Indonesian Sustainable Palm Oil Standard (ISPO) certification showed the Government of Indonesia is considerably weakening the standard. The changes proposed by the Government of Indonesia would, among other things, remove independent monitoring and replaces the word “protection” with “management” with respect to natural ecosystems. 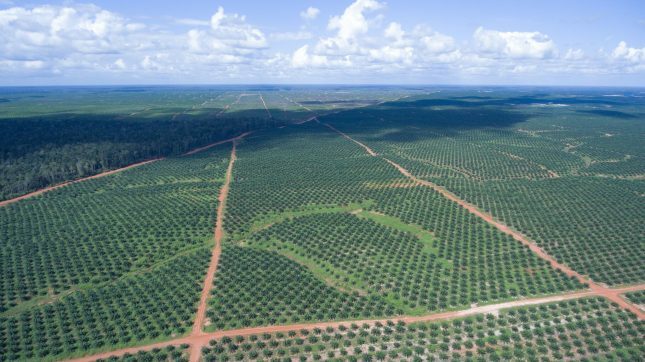 Assets stranded by changes in policy or undevelopable land continue to represent a huge risk in the Palm Oil Sector. CDP recently reported that global corporations had in 2017 USD 941 billion in annual revenue-at-risk from deforestation-related commodities. Indonesia is not immune from this phenomenon: 6.1 million hectares (ha) – or 3 percent of Indonesia’s land – of forest and peatland in Indonesia are currently considered “stranded assets” on the balance sheet of Indonesian companies that they are unable to be develop given corporate buyer NDPE procurement policies. 73 percent of these palm oil companies have committed to reduce or remove deforestation from their supply chains. In Indonesia and Malaysia, companies with NDPE policies currently operate a combined refining capacity of 53.2 million metric tons per year. This represents 74 percent of the total capacity in these countries. Of the 15 largest refiners in Indonesia and Malaysia, 11 have NDPE policies. This represents a higher commitment to NDPE policies than in the rest of the world, where – based on refinery count — NDPE policies cover 65 percent of the refinery market. By weakening its standard for palm oil, the Government of Indonesia could create further risks of environmental damage and rights violations, reducing international demand for Indonesian palm oil: just three weeks ago, on January 24, PepsiCo announced that the company and its joint venture with Indofood Sukses Makmur, IndoFood Fritolay Makamur (IFL), had suspended purchasing palm oil from Indofood Agri Resources (IndoAgri). PepsiCo stated it made this procurement decision because “PepsiCo is very concerned about the allegations that our policies and commitments on palm oil, forestry stewardship and human rights are not being met.” Increasing the ISPO standard’s strength could prevent future repeats of this incident. While traders and palm oil buyers globally are trying to source more NDPE palm oil from Indonesia, the Government of Indonesia, by not strengthening ISPO, will not achieve its goal of increasing international recognition for the standard and to create financial benefits for companies joining the program. Although this is a missed opportunity to make ISPO an international standard that is desirable for foreign companies, the low adoption of the standard coupled with the popularity of RSPO means that the change will have little immediate impact.